Click Here For Christmas Resources. For more information on the O Antiphons, see Observing the O Antiphons by Jennifer Gregory Miller, scroll down to the bottom of this page, or go to our Prayer page. Beginning the Church's liturgical year, Advent (from, "ad-venire" in Latin or "to come to") is the season encompassing the four Sundays (and weekdays) leading up to the celebration of Christmas. In 2017, Advent begins on Sunday, December 3. Scroll down for more Advent music! And, if you have little ones, they highly recommend the album Waiting Songs by a band called Rain for Roots. It's full of singable songs that help kids understand the struggles and hope of waiting for God. ​Each week of Advent and Christmas, we will upload a new reflection resource on our Worship tab. There you will find a prayer, illustration, and a reflection on the Sunday Scripture and a reflection for each weekday-about the day's Scripture, saint, or Catholic practices, along with a smaller illustration. Citations for Scripture readings are included with each day. Every day until Tuesday, December 25, this page will present one new incredible image of our universe from NASA's Hubble telescope. Be sure to bookmark this calendar and come back every day until the 25th, or follow on Twitter (@TheAtlPhoto), Facebook, or Tumblr for daily updates. I hope you enjoy these amazing and awe-inspiring images and the efforts of the science teams who have brought them to Earth. Click here for the Hubble Space Telescope Advent Calendar. ​Scroll down for more Advent Calendar suggestions. What would it take for you to have your best Christmas ever? We prepare for everything we consider important in life, and that includes Christmas. We shop for gifts, bake cookies, decorate our trees, and visit family and friends until we're ready to drop. Best Advent Ever is a free email program that will help you prepare for Christmas in a different way.and visit family and friends until we’re ready to drop. Best Advent Ever is a free email program that will help you prepare for Beginning the first Sunday of Advent (December 2) and continuing every day until December 26, you’ll receive short inspirational videos, practical tips, or free Christmas music that will help you slow down during the busy Christmas season to focus on what’s really important in life. Embrace the Advent season as a sacred space from the ease of your e-mail inbox. Sacred Advent is a daily e-mail prayer break during a busy season. Each day invites you to a step-by-step progression of praying with a Scripture reading and related points of reflection. The messages also include suggestions for further exploration of Advent themes through additional online articles and prayers. Based on the writings of Sacred Space—the trusted online prayer site by the Irish Jesuits--Sacred Advent will make this Advent a season filled with sacred moments. Sign up to receive the daily messages from the First Sunday of Advent through the Christmas season. ​December 3, through Monday, December 25 (Christmas Day), Bishop Barron will send you a short email with an uplifting spiritual reflection. You'll also receive exclusive videos, access to free giveaways of Bishop Barron's DVDs and books, and special discounts on new and exciting resources. Members of "Out at St. Paul," a vibrant LGBT ministry at the Church of St. Paul the Apostle in New York City (run by the Paulists) will be offering daily Advent meditations geared towards LGBT Catholics and their friends and families. To sign up to receive these meditations, just email them at osp@stpaultheapostle.org, and they will send them to you, or look for them everyday, once Advent begins, at http://www.outatstpaul.org/. The USCCB Advent calendar can help you fully enter into the season with daily activity and prayer suggestions to prepare you spiritually for the birth of Jesus Christ. Busted Halo's 2018 Advent Surprise Calendar brings a sense of surprise by showing you the whole calendar, but not letting you “open” each day and find out what’s behind the picture until that day comes along. Each day, the link will lead you to a special Advent-themed Daily Jolt and MicroChallenge. Loyola Press Advent Calendar for Adults invites you to slow down this season and discover the quiet moments of Advent hope. Each day of Advent, you’ll be directed to a reflection, media link, or activity to inspire you. Bloggers Vinita Hampton Wright, Joe Paprocki, Paul Brian Campbell, SJ, Jim Manney, and others share resources to nurture your spirituality at this busy time of year. The Irish Catholic Bishop's Advent Calendar for 2017 includes an audio thought for the day on a different theme for each day of Advent. The Jesse Tree helps us connect the custom of decorating Christmas trees to the events leading to Jesus' birth. The Jesse Tree is named from Isaiah 11:1: “A shoot shall come out of the stock of Jesse, and a branch shall grow out of his roots.” Jesse was the father of King David. We adorn a Jesse Tree with illustrated ornaments that represent the people, prophesies, and events leading up to the birth of Jesus. The ornaments of the Jesse Tree tell the story of God in the Old Testament, connecting the Advent season with the faithfulness of God across four thousand years of history. The Loyola Press Jesse Tree offers ornament ideas, in depth reflections, and links to bible verses. 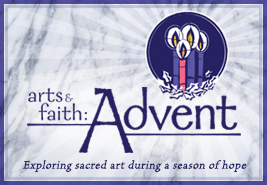 Prepare for Christmas and deepen your experience of the Advent season this year with Arts & Faith: Advent. Each week Loyola Press will provide a video commentary about a work of art inspired by the Sunday Scriptures. Use these videos to take a new look at this season of hope and preparation through the lens of sacred art. ​This song was originally written by Chris Eaton, but Amy Grant wanted to record it and asked Chris if she could rewrite some of the lyrics from a woman's perspective, namely Mary. Chris agreed. So this is Amy's version. The images are from the wonderful movie "Nativity Story"; if you have not seen it, do it, whether it's Christmastime or not. Traditional 12th century Latin hymn, English text with lyrics performed by a traditional choir. A contemporary song for Advent by David Haas. John Michael Talbot live in concert. 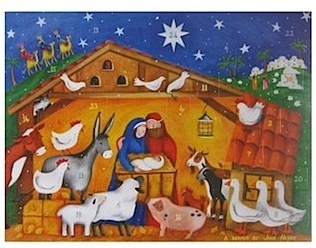 The Birth of Jesus: Two Gospel Narratives is a free, online, self-paced tutorial written and narrated by Philip A. Cunningham, former Executive Director of Center for Christian-Jewish Learning at Boston College. 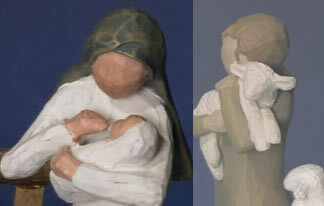 It is a collaborative project of the Center and STM Online: crossroads. The tutorial begins by exploring how the Catholic tradition and recent biblical scholarship understand the origins of the Gospels and their proper interpretation, continues with discussions of the Infancy Narratives in the Gospel of Matthew and the Gospel of Luke, and concludes by considering the two infancy narratives in relation to what is known historically about the late Second Temple period, their similar theological lessons, and some reflections on how they inform the Christian faith in our world today. December 17 marks the beginning of the "O" Antiphons, an ancient part of our liturgy, dating back to the fourth century, one for each day until Christmas Eve. These antiphons address Christ with seven magnificent Messianic titles, based on the Old Testament prophecies and types of Christ. The Church recalls the variety of the ills of man before the coming of the Redeemer. 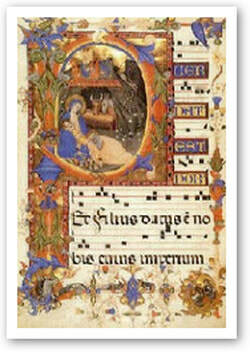 For more information on the O Antiphons, see Observing the O Antiphons by Jennifer Gregory Miller.